While it’s been routine for quite some time to move mission-critical apps into virtual machines, virtual server data protection strategies are still fraught with backup and recovery gaps. In order to get the most from your investment, it’s critical to address these common pitfalls. 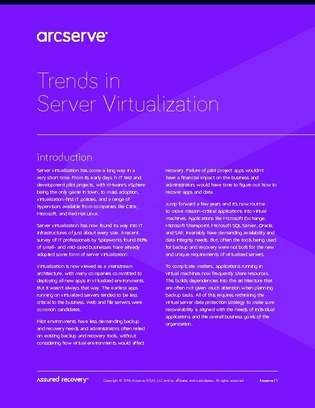 In this exclusive 17-page server virtualization guide, explore an in-depth look at pros and cons of server virtualization today, top backup issues unique to virtualization, new recovery and backup capabilities emerging, and much more. Additionally, explore a unified platform built to address the virtual server backup and data protection demands facing today’s complex IT environments.